Before I discovered that Spanish filmmaker Jaume Collet-Serra’s 2011 international existential identity thriller Unknown was based upon the 2003 French-language novel Hors de Moi or Out of My Head by Didier van Cauwelaert, I assumed it was a fictionalized adaptation of British filmmaker Rupert Murray’s 2005 Sundance award-winning existential identity documentary Unknown White Male. For in addition to the topical and thematic similarity between the two, when you consider the fact that before it was eventually shortened to Unknown , Collet-Serra’s blockbuster WB picture had originally been developed under the exact same name of Murray’s nonfiction indie feature, a sense of cinematic déjà vu was bound to be a side effect. And further complicating matters, as it stands, Unknown may inspire even greater misunderstandings in its home entertainment debut, given that the star-studded Liam Neeson movie will be shelved and queued alphabetically alongside another recent release about temporary amnesia and/or unknown accident inflicted confusing trickery that arrived by way of Colombian helmer Simon Brand‘s 2006 movie entitled – you guessed it – Unknown. Luckily, all three films are in all actuality quite different and well-worth seeing in their own right with an overall quality level that moves backwards in time from “good” (Unknown , ‘11) to “great” (Unknown, ’06) to “gotta see it again” (Unknown White Male, '05). Nonetheless, in retrospect it’s ironic that what happens onscreen with regard to mistaken identity, identity tampering or identity theft in addition to doubles and doppelgangers will happen to the trio of titles offscreen as well as viewers attempt to track down the right films and process the information along with the various protagonists as life imitates art. And in Unknown , the importance of art carrying over to life is not lost on those behind the scenes with screenwriters Oliver Butcher and Stephen Cornwell (son of master spy novelist John le Carré ) and director Collet-Serra in bringing van Cauwelaert ’s tale to the screen. Setting the stylistically old-school story of identity lost, found, manipulated, replaced and rebuilt in the architecturally gorgeous and allegorically and historically existential location of Berlin, Collet-Serra and cinematographer Flavio Labiano filmed on forty distinct locales in forty-eight days, using the once-divided city as “an extension of the main character,” Dr. Martin Harris (Neeson). 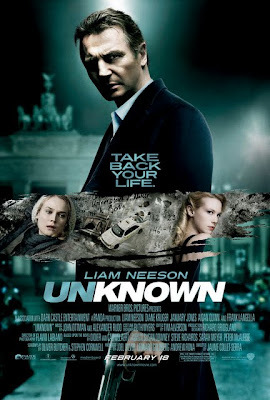 Following a horrific disaster that sends his cab off a bridge, Liam Neeson’s American botanist in Berlin is freed from the freezing wrecking of an otherwise certain watery grave by the quick-thinking bravery of Diane Kruger ’s Bosnian cabbie Gina. Yet just as quickly as Martin Harris begins to physically recover his first accident he finds himself in the midst of another psychological crisis – that may or may not be an extension of his recent misfortune. After exiting the hospital, he manages to reunite with his wife Liz (January Jones ) back at the hotel where he’d last left her, only to discover in a Kafkaesque twist that another man (Aidan Quinn) has taken not just his name but his place, kicking Collet-Serra’s existential dilemma into thriller gear. Of course, it must be said that Martin’s pre-accident behavior had been mindboggling from the start, particularly as evidenced in his decision to immediately duck back into a cab to return to the airport to retrieve his forgotten briefcase without so much as a word or a wave to his lovely wife who was waiting just inside the lobby. Yet, word or wave be damned, since even though he’s lacking in people skills, we’re as flabbergasted as Martin is when Liz not only denies knowing the man we’d watched her cuddle up with on arrival but also fails to recognize Martin as her husband – referencing Quinn’s character as the man with that claim. 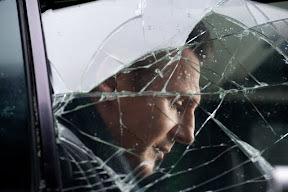 Unfortunately, given the way that Martin gets so angry so quickly – irrationally not explaining to others that the reason that he’s missing his ID, papers and hotel key is because he’d nearly died in the hospital – Martin’s post-accident mannerisms don’t help his case (or Neeson’s character’s likability) in the slightest. 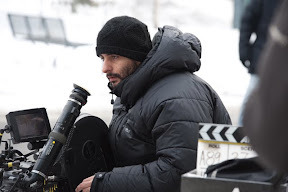 However, what Unknown lacks in logic whether on a small interpersonal scale or a larger plot-based one, Collet-Serra makes up for in assured, intelligent direction, incorporating his passion for the filmography and iconography of Alfred Hitchcock to the work’s motion picture equation that starts with a solid foundation of Brian De Palma’s Blow Out , David Fincher’s The Game , and Roman Polanski’s Frantic. 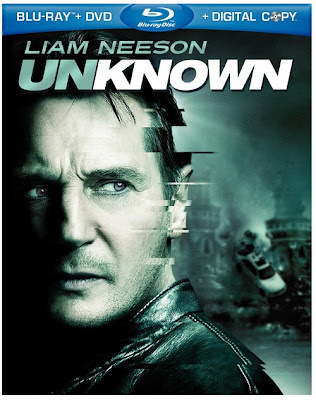 Soon Neeson’s mission-bound stranger in a strange land tracks down the illusive Gina and tries getting in touch with an American friend (Frank Langella ), hoping to uncover the secrets of his past including those he might’ve been better off forgetting. In doing so, Martin and vicariously the entire audience quickly realize that while he’s busy hunting down his unknown past including the identity of the unknown man portraying him, unknown others are hunting him in the present to alter his future. Taking us with him the whole way even if we don’t quite take to Unknown the way we took to Taken, the versatile Neeson returns to action-mode to audience delight after his A-Team setback. Bringing all he has to his role, whenever the stunts threaten to dominate the actors or our suspension-of-disbelief has reached its breaking point, Neeson manages to steer our attention back to Martin’s emotional (as opposed to intellectual) plight. However, one actor can’t do it all alone, regardless of how talented the rest of the ensemble cast is with special attention owed to the two Hitchcockian blondes played by Jones and Kruger as flipsides of the same smart, strong, enigmatic female character in a double and doppelganger filled script. 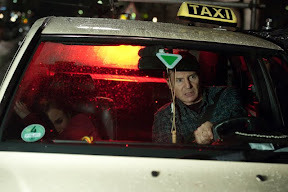 Despite Butcher and Cornwell’s ingenious beginning that sets up the film like an intriguing game of cat-and-mouse, with delusions of Frantic grandeur and a tendency to force clues out in the open, telling us things rather than trusting in viewer intelligence or meeting Neeson halfway, Unknown begins to collapse under its own unsupported weight. Featuring a few too many instances of magician-like forced misdirect, which push us against all reason to look one direction when we know that the obvious answer can be found by looking the other way, Unknown slides into cruise control far too early on before coasting into an overly long, repetitive and drawn-out final act. Yet suffice it to say that because the caper is played out in a sophisticated cinematographic landscape amidst the beautiful steel gray tones of Berlin's architectural wonders, buildings and stones, Unknown still makes for high-class European escapist fare that's been impressively transferred to high definition Blu-ray, bringing the theatrical experience to your home. Attaining success as a picturesque thriller on a level the humdrum Tourist could not, although the slightly emotionally detached Unknown may not last very long in your short-term memory as one of three recently released tales about unknown white males, overall it's a coolly contrived but efficiently effective, entertaining popcorn picture. Text ©2011, Film Intuition, LLC; All Rights Reserved. http://www.filmintuition.com Unauthorized Reproduction or Publication Elsewhere is Strictly Prohibited and in violation of the Digital Millennium Copyright Act.